The game makers of China, not content to let the Koreans corner the market on Team Fortress 2 clones, have created their own in Final Combat, only this one is way, way more blatant than previous efforts. Meet “the Rocket,” part Team Fortress 2 soldier, part Chinese fireman, all unoriginal. He’s just one of nine classes teased at the official Final Combat web site, each of which appears to be lifted almost directly from Valve’s game. There’s a Pyro with a guitar on his back, a Scout armed with a hockey stick, and a Demoman, distinguishable from his TF2 counterpart only by heavy armor. It looks like Final Combat added at least one twist. The game’s Medic and Sniper equivalents appear to be of the female persuasion. 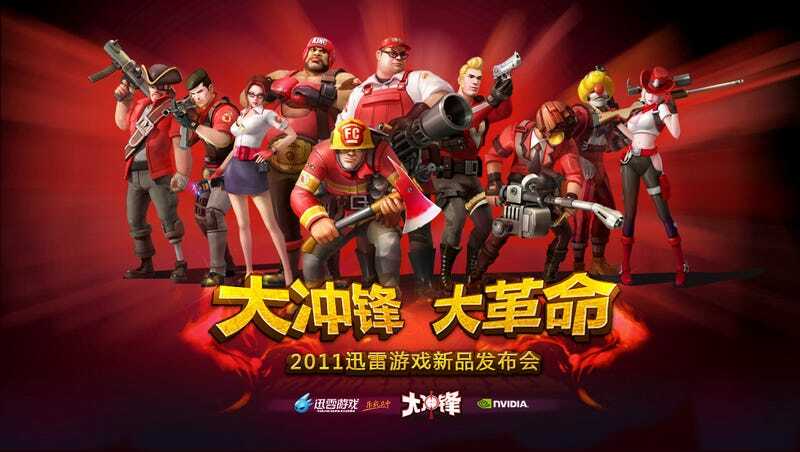 Like many of the games on the Xunlei portal, Final Combat looks like a free to play PC shooter of lower than Team Fortress 2 or Battlefield Heroes quality. Now, we haven’t actually played Final Combat yet, so it may be a wildly different game than Team Fortress 2. I’m just pining my rip-off accusations to Final Combat’s blatant swiping of Valve’s character design, sound effects, voice over, interface, typeface and humorous class introduction videos. Well, I’m also just assuming these are humorous videos, that bee stings kill in China. So maybe I’m way off. Judge for yourself.